Previously i blogged about the pathetic wages of fast food workers in Ditched Fast Food. 6.5 years & counting. 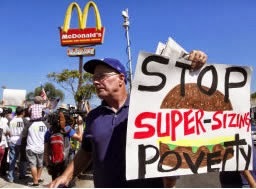 Now, 2 days ago news came out that just McDonalds alone cost the american taxpayers US$1.2B per year in public assistance as those fast food workers have problems raising even 1 kid. Besides being unhealthy junk food, this gargantuan in super sizing public costs is another reason why we ought to boycott fast food restaurants that are spamming like weeds. What is good for the fast food companies is not necessarily good for the country be it USA or SG. Look at the obscene multi-million CEO salaries compared to its workers who can't even properly afford to raise 1 kid. Certainly those junk food companies can pay more to their poorly paid workers given the nice profits they earned. This is an extremely good example of maximizing shareholder value by squeezing workers dry while having the rest of the country (taxpayers) to pay the tab in terms of subsidizing the low wages through public assistance. Is no wonder that USA & SG compete with each other for the dubious honor of highest income inequality among developed economies. With the flooding of cheap foreign workers from 3rd world nations in the last couple of years, the income inequality in SG is even worse than America. Just last month i've blogged about Illegal Hawkers - Peasants are Tenacious & Entrepreneurial that peasants (illegal hawkers) aren't giving a hoot about warning tickets & the lame state propaganda report that crime is at 29 year low. Ronald Reagan started the ball rolling by dismantling worker unions. We can see from the chart that % Workforce in unions took a sharp dive & along with it the middle class incomes nosedived from 1981. This is exactly what Sillypore's hybrid regime copied blindly as we don't see other continental european developed economies like Germany, France, Netherlands doing it. Today the co-called workers union in SG is an absolute joke as it is known for its supermarkets instead of protecting workers welfare. Trade union supermarkets that generally have higher prices than private sector Sheng Siong supermarkets - another joke. Make good companies grow stronger, make bad companies go broke. Are you gonna boycott these fast food restaurants? Very enlightening post! So ridiculous that CEOs are getting all the rewards while the actual ground people need to rely on govt for assistance. Subsidising big companies is a stupid way to woo business into Sg as profit is kept away from the majority of workers benefiting only the Top people. Sad that the world behaves this way. Many of the local supermarkets are also responsible for creating poverty in sg. The largest being the trade union supermarket which has dominated all areas in sg, killing off small time provision shops and even our markets are in trouble now. Gov allowed such large chains to kill of the small retailers and now they are reaping huge profits but paying peanuts to the rank and file employees. Consumers are not spared as there is little competition and prices have been rising ever so quickly.